Ananka's Diary: More Giant Beasts Discovered! A researcher in New Zealand claims that he recently discovered fresh moa footprints. 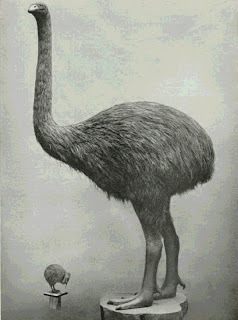 The twelve-foot-tall flightless birds are thought to have become extinct around 1500. Read more here. In South America, scientists have uncovered the remains of a giant prehistoric "rat" that weighed more than a ton and would have reached the size of a car. More here and here. im glad you didn't find any of those in the shadow city! and does anyone know how to cure the hicupps? i've had them all day and they're driving me bananas! D'you think a Reverse Pied Piper would work on one of those giant rats? Maddi- Start singing. Loudly. At the top of your lungs. If you're lucky, then you'll forget about your hiccups and they'll go away. Maddi- hang down upside down (like off the side of the bed) and drink a glass of water through a straw. Sort of related to the hicupps, there was a girl that had hiccups for like a month and after the first week her school would not let her come (to school) any more. Hey Theatre, what are you maybe changing your name to? 'Cause on our computer it just says "theatre (who might be changing her name to"
Once I tried holding my breath to cure hiccups, and then gave up after hiccuping several times while holding my breath. Maybe it will work for you, though. Good luck! well, the hiccups are gone now, but next time i get them im gonna sing at the top of my lungs while holding my breath and thinking of rabbits as i attempt to drink a glass of water through a straw upside down. i bet it will work! 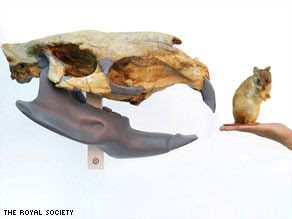 A huge rat and a large bird... Whoa, an extinct animal is rediscovered!! Maddi: all you need to do is put a paper towel over a cup of water and drink through the towel. Or, take a deep breath and hold it. Do that several times and it'll go away after a while. Which basically "translates" to interesting-thing-of-the-day-dot-com. The Australian Open is on in Melbourne. The courts are blue. Maddi: drink water from the wrong side of the cup. It'll work, trust me. RAPH & THEATRE: So good to have you guys back! Patsee, Elizabeth, and Daisy: Thank you guys for the fabulous tips! I really appreciate them. For hiccups, even though you got rid of them, I squeeze lemon juice into my mouth. It is gross but works! How is squeezing lemon juice into your mouth gross?